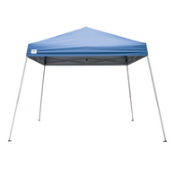 Our 9' x 9' pop up shade canopy tent is perfect for the beach or outside. Comfortably shades 4-8 people. Sets up in minutes. 100% UV protection. Colors and styles may vary. **NOTE** A $60.00 damaged equipment fee will be charged for any damages to this product.